Mikumi Solar Water Project in Tanzania – It is a rare occasion that you are able to revisit an experience that counts as a highlight both personally and professionally. I therefore consider myself exceptionally fortunate to be able to return to VETA Mikumi in Tanzania to continue the solar water treatment project started in 2016. The water supply and system at VETA Mikumi presents a truly tough engineering challenge. The chemistry of the water drawn from the wells on site is such that it causes a large buildup of calcium carbonate scaling in the plumbing infrastructure. This results in an ongoing requirement for retrofitting and replacement of water piping and fittings at significant cost to the college. Tough engineering challenges lend themselves to unique learning experiences. The 2016 project team had an idea that mechanical aeration of the water, powered by solar energy, would alter the water chemistry to mitigate the scaling issue. To that end, the project team designed and installed a prototype aeration system that, after overcoming a number of technical and logistical challenges on site, was shown to work as a proof of concept. For the 2017 project, a new student team was chosen that drew from across the spectrum of Engineering Technology disciplines at NSCC. The new team decided to pick up where the previous project had left off and to design a scaled-up version of the water treatment system that would handle 10,000 liters per day – 20 times the capacity of the prototype system. The project team met weekly for the entire Winter Term designing and specifying the scaled-up system. The students engaged in project planning and management activities, technical options analysis, system design, sizing & specification as well as budgeting and risk assessment. Many of the students had never worked on a multi-disciplinary team before, and the scope of the project pushed everyone outside of their respective technical boundaries. With a solid design and a clear plan in place, the team set off for Tanzania. It was there that the team expanded to include the staff and students of VETA Mikumi. Overcoming language and technical barriers, the NSCC students and their VETA counterparts worked together to construct and install the designed system. Of particular note are the Mikumi students that constructed the concrete pad, as well as the metal fabrication students, who were able to make customized hardware built to precise specifications in short order, and often based on hand-drawn diagrams. During our first week at VETA Mikumi, the campus hosted an Open House that was attended by hundreds of people from the surrounding community. During the event, there was a great deal of interest from people regarding the solar water treatment project. It was here that we learned that the hardness issue experienced by VETA Mikumi is ubiquitous to the groundwater in the surrounding area, making it hard to use and disinfect. 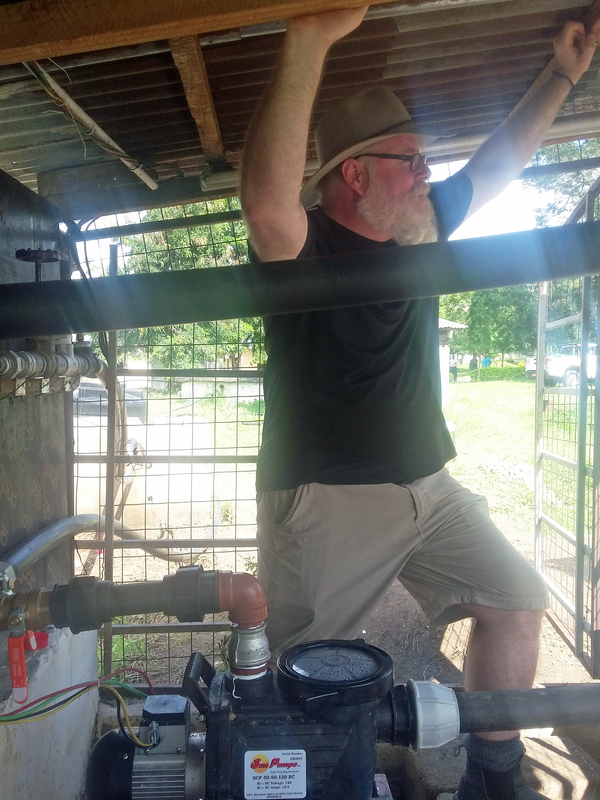 There was excitement expressed from people that there could be a relatively simple, scalable solution to this water quality problem that did not require chemicals or expensive equipment. The slogan of the VETA Mikumi Open House was “Tunasababisha”, which roughly translates from Swahili as “Making it Happen”. This became the unofficial motto of the project. Whenever there was an issue that came up or a problem that needed to be solved (and there were many), the response became “Tunasababisha!” This philosophy of “Making it Happen” was particularly useful in our troubleshooting and repair of an existing solar well pump, integral to the design of our system, which was found to be not working on our first day on site. In the end, we were successful in constructing and implementing the solar water treatment system with surprisingly few changes from the original design. Preliminary testing of the water through the system indicates that it does work in significantly reducing the level of hardness in the water. With this knowledge, the system can be improved, perfected and shared with the local community to improve water quality at other locations. It should be noted that the solar water treatment system (along with the prototype system installed in 2016) is completely innovative in its design and application. While some of the components are “off-the-shelf”, the system itself was designed completely from scratch by the student team. That the system ended up being constructed and is operating more-or-less as designed is a testament to the technical skill of the NSCC and VETA Mikumi students. As an instructor in a technical program, there are few things more satisfying to me than seeing a successful student engineering project. This project was no exception, and I am proud to have witnessed the growth and development of such a highly performing group of technical professionals. However, of equal measure was the opportunity to work and visit with my colleagues at VETA Mikumi again. Without their expertise and enthusiasm, the project would not have been successful. I consider them all my friends and mentors, and I look forward to meeting with them again.